Branded Visa Credit Cards from Linux! Branded Platinum Visa Credit Cards from Linux! 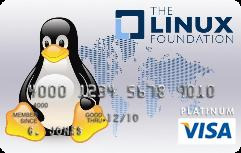 Linux Foundation, the non-profit that supports the growth of the Linux kernel, is today announcing an affinity Visa Platinum credit card for people who want to contribute to advancing the OS through the organization’s initiatives. The Linux Foundation is partnering with CardPartner to offer the credit card through UMB Bank. The organization will receive $50 for every activated card as well as a percentage of every purchase made with the credit card. The Linux Foundation also says 100% of the proceeds from the Visa card program will go directly towards providing community technical events and travel grants for open source community members in order to accelerate Linux innovation. Initially, the custom Linux Foundation Visa Platinum card is only available to U.S. residents, but the organization expects to expand in the coming months. Want to apply? Click Here!